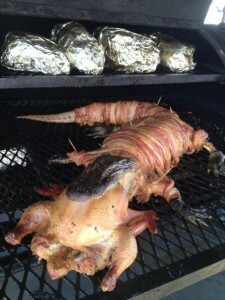 Bacon Wrapped Alligator With A Whole Chicken Stuffed In Its Mouth. This definitely is not Grandma’s recipe. Unless grandma comes from the south. 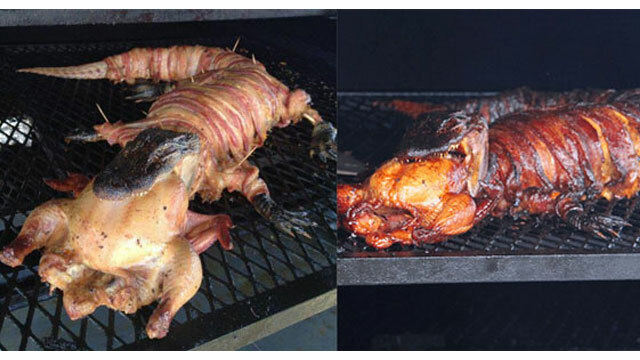 This whole grilled alligator is wrapped from the neck to tail in flavorful bacon. It is topped with a whole roasted chicken stuffed in its mouth. You’d probably have to be selective of who you invite over to your barbecue. I think it would scare most people off. 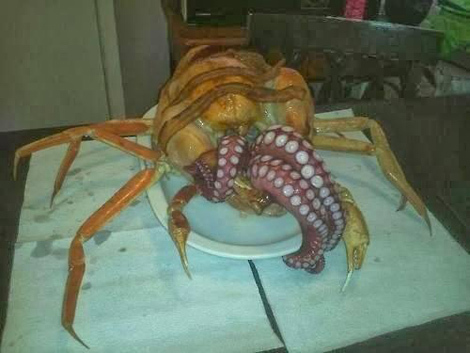 And if a Bacon Wrapped Alligator With A Whole Chicken Stuffed In Its Mouth is not enough for you, you might want to try a cooked bird with crab legs with a cooked octopus hanging out of its cavity. Or a wild boars head, the crown of a chicken, and the wings of a goose on the torso of a lamb. This taxidermist stuffed delight may or may not have people coming back for more. 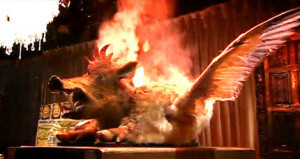 This monstrosity was posted by @alixmcalpine oon twitter as he shows off his Australian barbecue talents. you definitely want to Facebook, Tweet or Pintrest this. You really have to see this to believe it. Top 5 Scariest Supernatural Clips EVER!